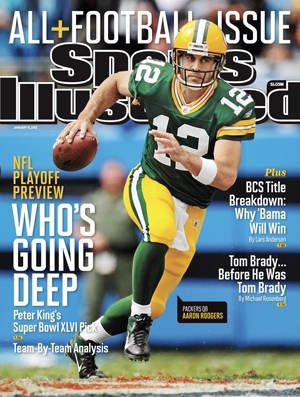 Packers QB Aaron Rodgers is on one of four regional Sports Illustrated covers for the magazine’s annual NFL playoff preview issue, which hits newsstands this week. All the covers feature quarterbacks, as New Orleans’ Drew Brees, New England’s Tom Brady and Pittsburgh’s Ben Roethlisberger are on the other regional covers. In his playoff preview story, SI’s Peter King predicts the Packers to beat the Giants in the NFC divisional round, and then the Saints to beat the Packers in the NFC Championship at Lambeau Field. He picks the Saints to then win Super Bowl XLVI over the Patriots. King calls it a “wide-open” playoff field because he sees as many as nine teams with a realistic chance to win it all. King also selects Rodgers as the NFL MVP for 2011.